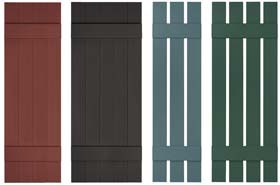 Many widths & styles of shutters to choose from, and heights every 1/4"
Custom vinyl shutters can not be returned; we do not stock them, they are made to your order. Click on one of the picture styles above for pricing and size options! Durable polypropylene co-polymer vinyl, maintenance-free U.V. stabilized. Paintable shutters are made from Polystyrene. Priced, sold and shipped per pair. 18 Colors plus a paintable option. Widths: 9-1/4", 12", 14-1/2", 16-1/2", 18". Lengths: From 18" to 120" (in 1/4" increments | lengths are nominal). 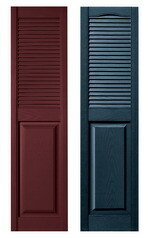 All shutters are constructed with color moulded-through so they won't scratch, flake, or fade. Custom Combination Shutters fuse the sturdiness of a Panel Shutter and the delicacy of a Louver Shutter for a wonderful blend of traditional American styles. Available in straight top or cathedral top. Durable polypropylene copolymer vinyl, maintenance-free U.V. stabilized, wood grain texture. Packaged: Boxed pairs with with color matched mounting screws.